The “tS” badge will from now on be used to identify special edition models that are not quite as extreme as the “S” and “R” variants. 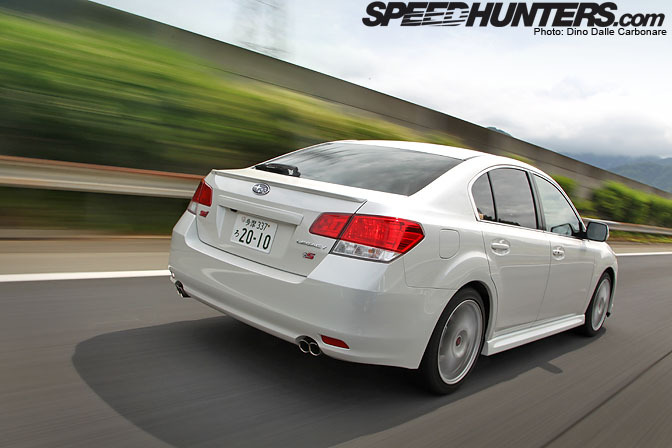 Only 600 of these Legacies will be sold and I wouldn’t be surprised if all have been snapped up as back in June, before the car was even released, STi had already received 200 pre-orders. 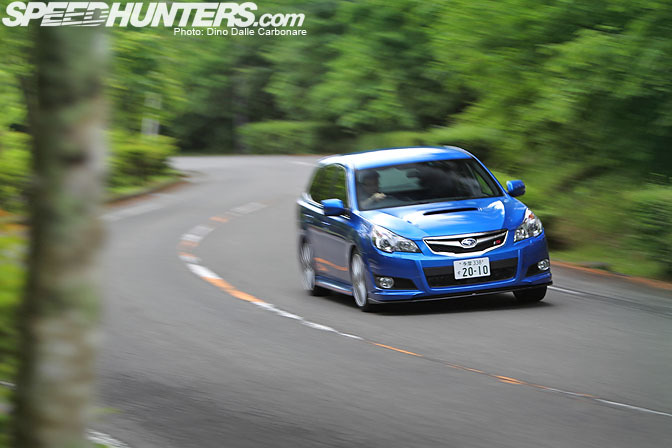 We had a chance to sample both the wagon and sedan versions of the Legacy tS on the way down to our shooting and test-driving locations at the feet of Mt.Fuji. 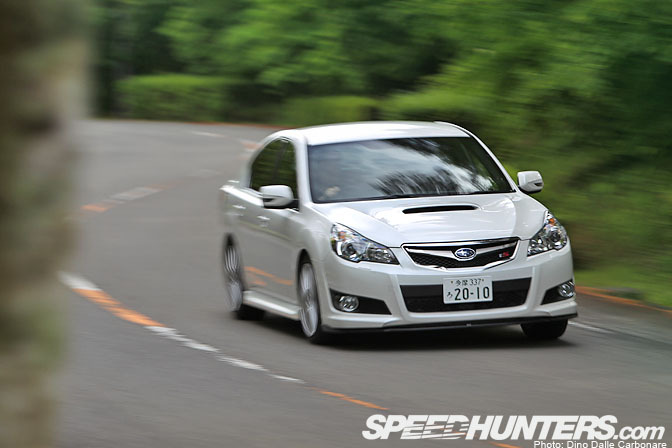 …and a front STi lower lip spoiler that helps give the new Legacy a sportier feel. 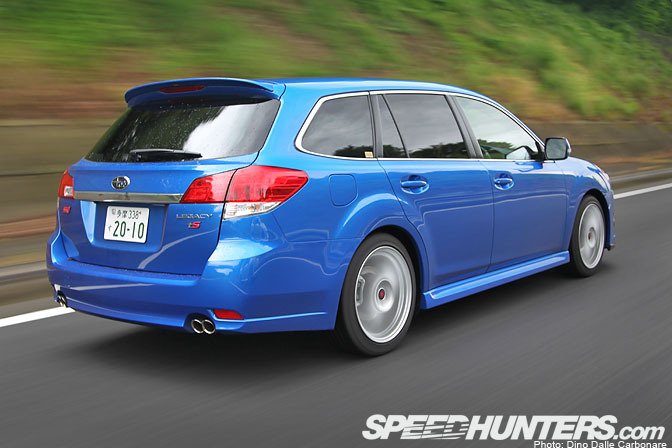 As an owner of a previous generation Legacy wagon I have to say I was very disappointed to see the way Subaru has decided to go with the now much bigger and curiously styled replacement. However, over time I have began to digest the lines of the new car and the STi treatment definitely makes it slightly easier to look at. Open the driver side door and you are greeted with a pleasant whiff of leather from the more supportive STi seats. The STi branding continues on the kick plates, the steering wheel, the gear selector instrumentation and even the engine start button. The SUV-like tall glasshouse has introduced an impressive amount of headroom, so much so that you really need to ask yourself why a station wagon needs to be quite so tall, especially when Subaru has the Exiga which offers the tallest headroom out of any station wagon on the market. Still, the interior is now comparable in size to the BMW 5-series, which is a good thing for export markets where Subaru needs to make sure it stays competitive in. The optional McIntosh audio system is the aural delight it has always been on Legacies and now even more so with it’s 10-speaker 5.1 surround layout. 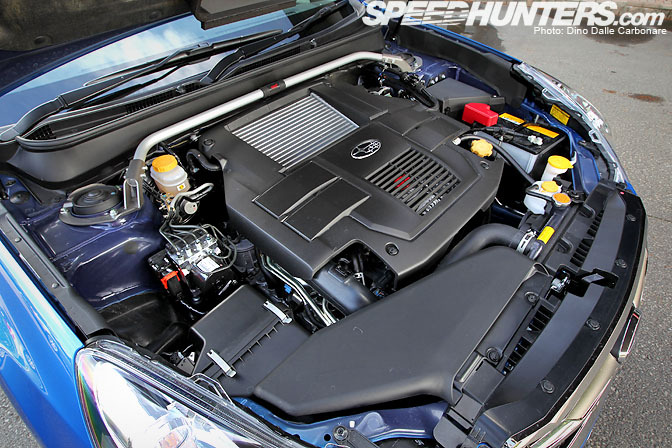 The engine is the 281 HP EJ25 turbo as found on the stock GT version, now dumping its gasses through a very pleasantly sounding, if a tad too quiet, STi exhaust system. Other obvious addition are the 18-inch multi-spoke wheels which seeing the rather gargantuan size of both the sedan and wagon are a little on the small side. 19-inches with a little more “right” offset would have looked so much better. 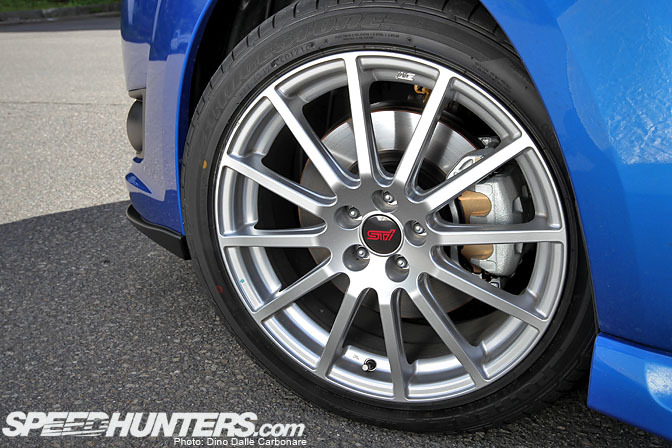 The brakes are the same cast calipers as on the stock GT, not pretty to look at through the spokes to say the least, but up to the job of satisfying what and average owner of such a car would demand. 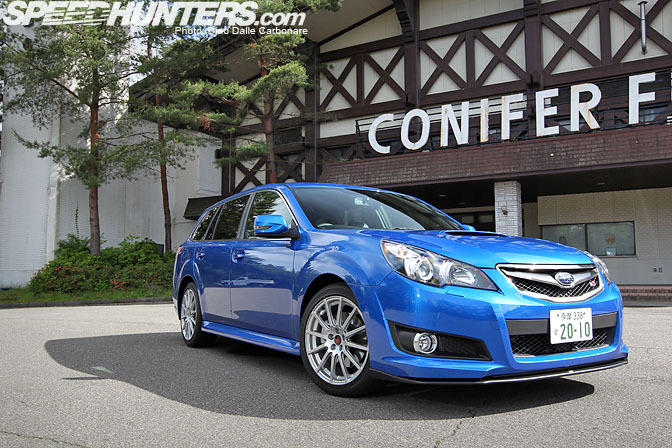 A Brembo braking package in this price range (4,187,400 Yen for the wagon, 4,029,900 fro the sedan) would have been hard to justify, but a definite welcome addition. There is no arguing that the STi treatment does help give the Legacy more intent, especially when the car is finished in that unmistakable WR Mica blue. The tS is loaded with an STi tuned suspension package which sees the stock dampers replaced with specially tuned Bilstein items along with slightly stiffer and lower STi pink springs. Special mention has to go to the STi front strut bar with its flexible center joint which helps make the front end more rigid through corners but at the same time allow for a little give on turn it to kill potential understeer. This improves steering feel and allows to enter corners faster and more efficiently. To inject more feel into the chassis harder STI bushes have been added along with flexible chassis braces as well as front and rear STi lateral links. The rear-subframe gets flexible braces too which, out on the test route, really showed a perceptible improvement in stability from the whole handling package, allowing the car to be pushed harder all the time staying very composed and compliant. This only became evident when we had a chance to put it up against a stock GT, which in comparison rolled and lacked precision over the same corners. The old 5-speed automatic that Subaru have decided to keep using on this new Legacy felt slightly surpassed compared to the dual clutch systems or 6-7 speed torque converters manufacturers are moving towards these days. The white sedan test car felt a little livelier thanks to its lighter weight (1,745 kg vs 1,815 kg, 40 kg lower than the wagon) and the 6-speed manual gearbox, which obviously introduced a whole new level of involvement. Still there is no denying the Legacy is a big and heavy car, feeling brisk rather than fast in most situations. The EJ25, even when left in S# mode on the SI-drive setting, is beginning to feel out of its element in a class of car that seems to keep growing bigger and taller. Maybe now is the time for Subaru to start looking at twin-turbo charging the 3.6 L EZ36 flat-6 that powers the new Outback. I know I’m only thinking out loud here but wouldn’t that make for a true performance Legacy? The tS does a good job of bridging the gap until the fully fledged “S” model arrives, but I think time has come for Subaru and STi to go a little wilder with their cars, after all they are trying to emulate the Germans at their own game and it’s not like M-Power, AMG and the S and RS line up of Audi’s are hanging around. Great review, and I totally agree with you. I wish that they kept with the styling que of the old legacy. I loved that thing, and really regret not getting one here in the states. The new version although its growing on me, still seems like it was put in place when Toyota came to be the majority stockholder, and asked them to create something more camry/gs platform looking. A 3.8 H6 TT version of the Legacy would be Amazing! Sign me up, I'll trade in my 07 impreza sti for it, considering the cost is less then 45k usd. New Subarus are so ugly what are they thinking?? I like how you gave this review a more tuner influence vs. the article you wrote for Autoweek a while back. Regardless great pics and write up, Dino! 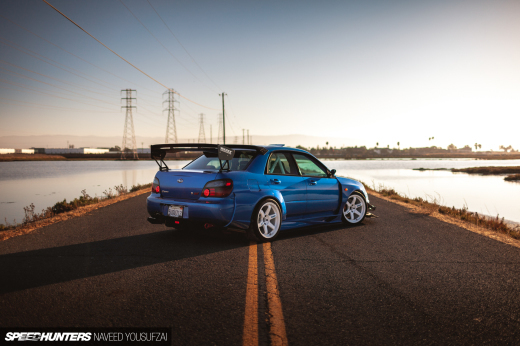 diffrent but i will stick with my REAL STi's. This is kinda like the evo hatchback....there just pointless. The new Legacy wagon is actually big enough to be officially counted as a crossover by most US insurance companies so yes, it is very SUV-like. Also, I like the choice of wheels, it seems to be there to remind you that the car's background is still the rally world, and as such it will not give in to the trend of ridiculous wheels. are you sure about the weight statistics? nearly 4000 lbs sounds a bit high, even for the new bloated legacy. Nice review otherwise, but I still can't get used to the huge size compared to the previous generation. 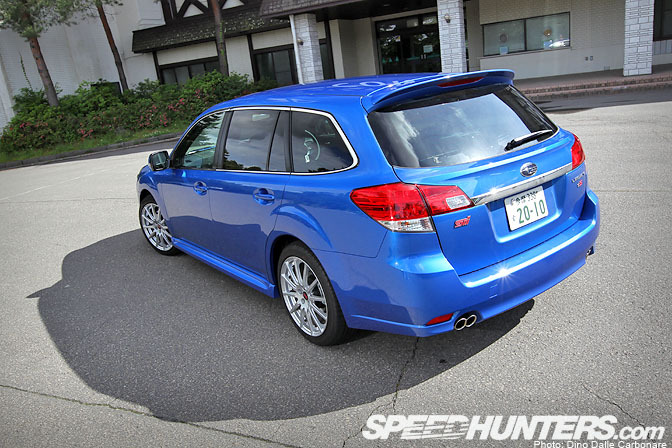 So when's the Forester tS going to get a drive? I have a friend looking forward to updating his Legacy (Liberty here in Oz) though, with him thinking it looks more agressive. To be fair, the front of the car does look pretty good, the rear is a let down though. And the size of the car, its dimension isn't too far away from a MPV. But oh well, there are those who does appreciate its larger interior though. Otherwise I will keep my BP5 GT-B for now. 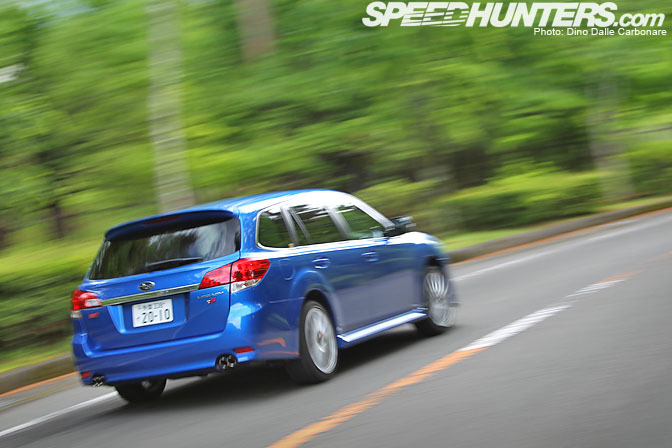 Maybe when Subaru comes out with their version of DSG (which they admitted is being investigated) and the new gen boxer engines and hopefully some touch up to the styling then maybe I will update my car. (Unless world does end in 2012). The new Legacy is too tall, too big and too heavy. It's very ugly too, the previous generation was pretty nice. Subaru needs to look at their past and realize that the Legacy was born in the rally stages, it wasn't intended to be a luxury car. If they still keep trying to go that way then they should put a new model in the line up; the Legacy has been adultered too much. a 2-ton "wagon," an old slushbox transmission, an engine bay with more plastic than metal, SatNav in case you're an idiot, a steering wheel with more buttons than my whole radio, giant 18s that still look more like 16s, the usual +55ish offsets... subaru is doing big things, i see.